Scavengers Beer Tour – View San Diego in a NEW way! You ever see one of these driving around downtown or up in Carlsbad? Were you like me and wondered what it was? I’ve saved you the time and did some searching. The vehicle is called a Pinzgauer (Pinz-gow-er). 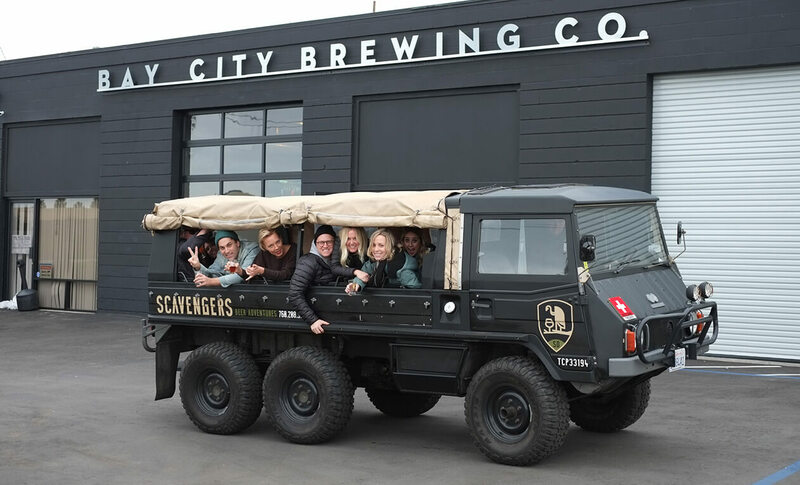 It’s a 6-wheeled Swiss safari vehicle owned & operated by Scavengers Beer Adventures. Scavengers is a guided brewery tour of craft beer stops in the North County or Downtown areas of San Diego. Tours usually take 4-5 hours and include 3 stops in the area of your choosing. For Downtown, the options include Ballast Point, Modern Times, and Coronado Brewing among others. For North County, the stops could be Rip Current, Mother Earth, and Belching Beaver or a bunch of others. Each person is given 4 tasting tickets for 6 oz tasters at each stop! On your way to the first stop, the guide will whet your appetite with a can of Ballast Point. Each tour also includes a meal (BBQ or Pizza). Obviously you have to be 21 to buy a ticket for the tour.